This 20 x 32-foot schoolhouse was built in 1885 for less than $539, using locally sawn basswood and maple. The interior walls are of decorative metal. It originally stood in the northeast corner of Section 9 of Ellsworth Township. Classes were held for six months each winter and two months each summer until 1907, when the winter term was lengthened to eight months. Low attendance closed the school between 1941 and 1944, and when pupils were transported to Iverson School from 1948 to 1951. Freier was open for classes again in 1952 and closed for good in 1957. Two years later, the building was moved to the Pierce County Fairgrounds in the Village of Ellsworth, where it stands today as a memorial to the county's rural schools. Pierce County Historical Association volunteers have maintained the building since 1972, opening it for Pierce County Fair visitors each August. The popular attraction contains the original blackboards and working steeple bell, as well as period desks, books, and other vintage school items. The Freier School is located on the grounds of the Pierce County Fair, and is accessible from northbound North Maple Street / Wisconsin Highway 65, at or near 364 North Maple Street, Ellsworth, Wisconsin 54011. NOTE: The school is located at about center of the fairgrounds. This is a pretty small fairground, and the school is fairly easy to locate. For more information about the schoolhouse and hours of operation, call the Pierce County Historical Association Office and Archives at 715-273-6611 or visit their website here. A map of the very small fairgrounds. 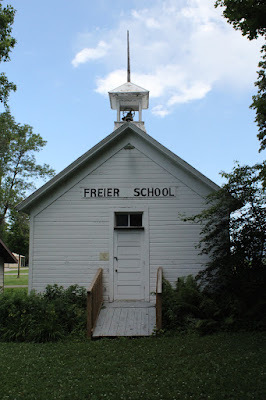 Freier School is located in Ellsworth, Wisconsin. New welcome sign June 2018.